KUALA LUMPUR (Jan 21): Malaysia’s ringgit extended a three-month loss to almost 10 percent, the worst in Asia, after the government’s increase to the fiscal deficit target prompted Fitch Ratings to warn of a credit-rating downgrade. The currency was already trading at its lowest since 2009 before Prime Minister Najib Razak yesterday raised the 2015 deficit projection to 3.2 percent of gross domestic product from 3 percent amid a slump in crude that’s eroding state revenue for Asia’s only major oil exporter. Fitch said its negative outlook on the sovereign indicates it’s “more likely than not” to cut the rating given the nation’s dependence on commodities. “The market is a bit concerned that we have a higher deficit target,” said Choong Yin Pheng, senior manager for bond and economic research at Hong Leong Bank Bhd. in Kuala Lumpur. Fitch’s statement “definitely has a bearing on the market,” she said. 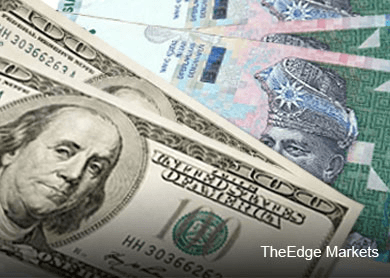 The ringgit weakened 0.5 percent to 3.6258 a dollar as of 10:07 a.m. in Kuala Lumpur and fell to 3.6277, the lowest level since April 2009, data compiled by Bloomberg show. One-month implied volatility climbed to a three-year high. Southeast Asia’s third-largest economy will expand 4.5 percent to 5.5 percent this year, compared with an earlier projection of as much as 6 percent, Najib said in a speech in the administrative capital of Putrajaya yesterday. The nation isn’t in crisis, he said. Australia & New Zealand Banking Group Ltd. lowered its year-end forecast for the ringgit to 3.60 from 3.45, citing further downward revisions to its oil price target, according to a research note published Jan. 21. Fitch rates Malaysia A-, the fourth-lowest investment grade and three levels above Indonesia. A 57 percent drop in Brent crude since June prompted Najib to cut the oil price assumption target for the 2015 budget to $55 a barrel from $100. It last traded at $48.32. One-month implied volatility in the ringgit, a measure of expected moves in the exchange rate used to price options, advanced 53 basis points, or 0.53 percentage point, to 11.21 percent. It earlier climbed to 11.26 percent, the highest since 2012. The yield on Malaysia’s 10-year sovereign bonds rose four basis points to 3.99 percent and has climbed seven basis points this week, data compiled by Bloomberg show. Official data due at noon may show inflation slowed to 2.8 percent in December from a year earlier, versus 3 percent the previous month, according to the median forecast in a Bloomberg survey.